I received the following from Stripe warning of the need to change to a new version of their API. Can you confirm that a new version of the Stripe plug-in is being developed? On September 14, 2019, a new regulation for authentication will be introduced in Europe. Known as Strong Customer Authentication (SCA), this regulation will apply to online payments within the European Economic Area (EEA) where the cardholder’s bank and the business’s payment provider are both in the EEA. Some businesses outside of Europe may also be impacted depending on how European issuers implement the new authentication rules. SCA requires that businesses use two independent authentication elements to verify payments. Transactions that don’t meet these new authentication requirements or qualify for any exemption may be declined starting September 14, 2019. 3D Secure 2—the new version of 3D Secure rolling out in 2019—will be the primary authentication method used to meet SCA requirements for card payments. Stripe is building solutions to make it easy for you to comply with the new regulation and minimize the impact on conversion. We have released a beta of a new SCA-ready API—PaymentIntents, that lets you dynamically apply 3D Secure whenever it is required or there is high fraud risk. PaymentIntents will provide support for 3D Secure 2 automatically in early 2019. As soon as SCA requirements go into effect, PaymentIntents will dynamically trigger 3D Secure 2 when required and apply exemptions to SCA requirements when possible. Currently in beta, you can find more about this API here. Over the coming months, we’ll be expanding the API’s functionality and releasing additional updates to other Stripe products to help you prepare for SCA. The "Stripe Connect (v3)" plugin in the HikaShop marketplace would be compatible with the new system ; it's currently under development with some other new features. hi, what features are you talking about? please make it ready for the payments setting "sofort" from stripe. 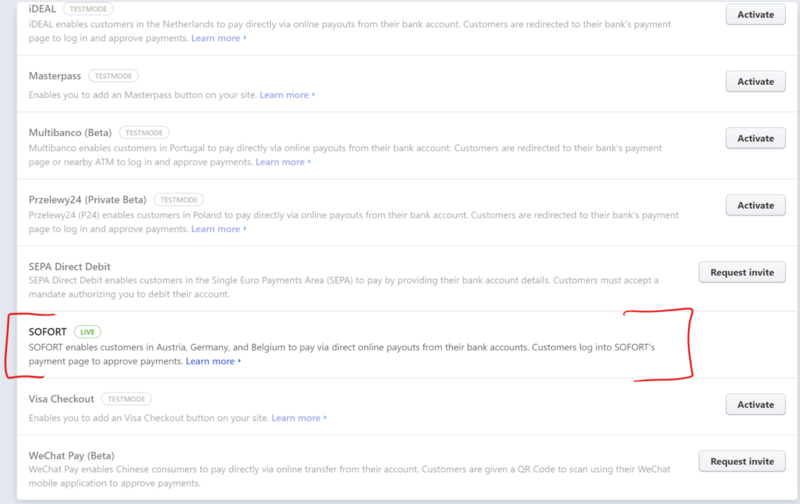 i attached a screenshot from stripe, where the service "sofort" is possible to enable. Last edit: 2 months 3 weeks ago by n00bster. Yes, integration of other card methods is what is under development ; since the new 3DSecure system will require the same modifications. But with the fact that the plugin is compatible with HikaMarket and the vendors, that development is more complicated because we are also dealing with the "connect" feature and elements like the fact that we can't know the vendor sub-orders before the creation of the order... Well, it's not simple but we are going forward ! I also have this message from Stripe. So, does your answer mean that the free V2 plugin will not be compatible with the new SCA? I'm glad I'm not the only one who felt the response from Hikashop wasn't clear! Q. Will Hikashop release a new version of the FREE Stripe payment gateway which will be SCA compliant? Q. If yes, approximately when? Q. If not free, what will be the cost? If the SCA requires 3D secure for all transactions (which seems to be the case reading what is written in the first message) then the plugin available freely for Stripe won't work anymore. We do not plan on doing a new version of that plugin to support it. That would basically require rewritting completely the current plugin, and Obsidev is already working on that. Thanks, Nicolas. That makes it clearer. It looks like the new regulation doesn't come in until September so I'll wait for the new V3 plug in to become available. Thanks Nicolas, that's now clear. Yes. There should be no problem to finish the new version of the plugin before that as the work is already quite advanced from what I heard. Just a quick query. Is the payment a one off for this plugin or an annual subscription? Will it include all future updates? You'll be able to download the latest version of the plugin for 5 years via the download link given to you after the purchase. After that the download link won't work anymore and you would have to purchase it again should you want / need to update it. However, I don't think there will be a need to update payment plugins unless Stripe disables and changes the version of its API the plugin is based on. So you should be fine for a long time.